Vatika Group is one of the leading real estate developers in India. Our residential projects are imbued with our belief of creating lasting values that help us stand apart from our contemporaries. We have excelled in developing real estates that are built to provide all the comfort and ease, you and your family desires. Vatika’s Infotech City is our magnum opus, which we have developed with the innovation and the creativity that we have garnered over decades of endeavours that will last for an eternity. Vatika Infotech City is situated in the beautiful city of Jaipur. The township has been developed in a lavish 600 acres of land, amidst the picturesque beauty of nature. It comprises of several independent residential projects that are built to serve individual needs, from high-rise apartments to independent plots. Ivy Homes is one of the 5 residential projects that Infotech City has to offer. The residential premises are beautifully landscaped, with homes offering the lively atmosphere and the view of the beautifully landscaped Central Park, surrounded by the beauty of nature. Ivy Homes are planned so as to provide all your basic amenities at convenient distances. The interiors of each home is designed by skillful and experienced architects, with creativity that transcends traditional living experience. Ivy Homes gives you the chance to experience living at the most exclusive address in Jaipur. Exclusivity and luxury combined with beautiful views is what Vatika Infotech City’s Ivy Homes has to offer. 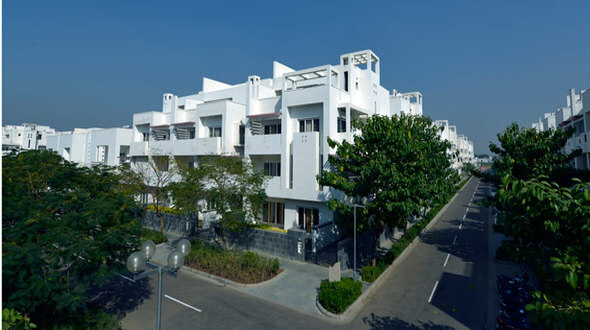 Ivy Homes has 80 independent villas, facing the grand and lively Central Park. These single-storey villas are built on 154 sq. m. plots, and come with the option of expanding onto the first floor as well. Intended for those who value fine living, Ivy Homes have been designed keeping in mind the exclusive lifestyles of the residents. .
Each unit has 2 bedrooms and 2 washrooms with spacious kitchen, living and dining area, front and back lawns. Every villa has a private parking space, as well as a separate car park for visitors. Every unit is well dimensioned and well ventilated allow natural light to come in throughout the day. This entry was posted in Township Jaipur and tagged apartments in Jaipur, residential properties in Jaipur, residential societies in Jaipur on December 9, 2013 by Admin.